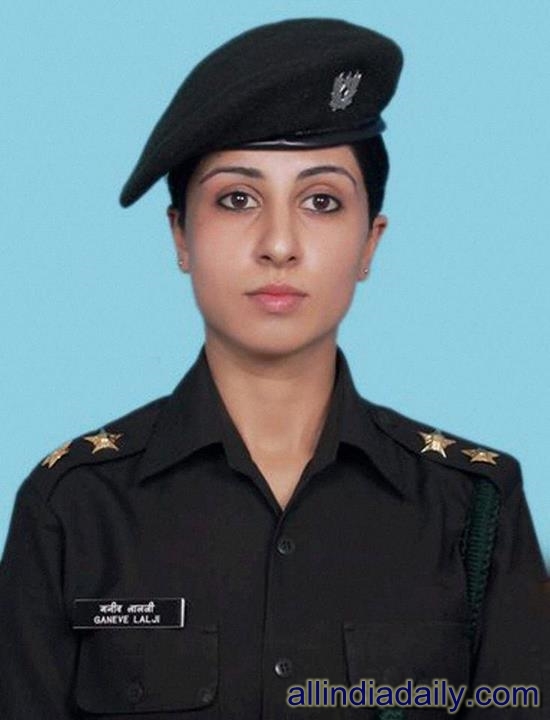 Lieutenant Ganeve Lalji, a young intelligence officer is set to create history by becoming the first woman to be appointed as a key aide to an Army Commander as part of Army Chief Gen Bikram Singh's efforts to provide more avenues to women in the force. She will become the aide-de-camps (ADC) of Central Army Commander Lt Gen Rajan Bakshi, who will be taking over his post in Lucknow on July 1. ADCs are officers who serve as a personal assistant of top officers including the Army Chief and Army Commanders. A third generation Army officer, Lt Lalji was commissioned in the Corps of Military intelligence in 2011 and has recorded several achievements during here Young Officers' course in Pune, an Army official said today. She has been selected for the appointment after a rigourous selection process, the official said. The step was apparently taken by Gen Singh after a study was ordered to measure the motivational and aspirational levels of women officers in the force. As many as 350 women officers were interviewed and were assessed on level of toughness and their ability to withstand hardships. An official said though a number of women wanted to be inducted for a combat role they were assured by authorities this could be done in a phased manner and they could get bigger and more important roles in the near future. The study commissioned by the Army compared the roles of its female officers with their counterparts in the US and other countries. The study also looked at the impact an increased role for women officers might have on their male counterparts.